I’ve always loved the elegance in the line drawings of Asian cranes. It’s a much-loved motif in a number of art traditions, and it’s easy to see why the appeal is so universal. 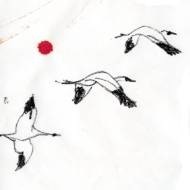 I drew a number of cranes to use as patterns, and have used the shape on quite a number of paintings in the past year. (Sometimes when I fall in love with a shape, it just keeps showing up!) The shapes going down the edge of the pink scarf are a mixture of my personal alphabet and shapes from Eastern European prehistoric rock art — I think of them as secret spells to protect the wearer. This scarf is on display and for sale at The Joyful Jewel, in Pittsboro, NC. It started as a white blank. I used gutta resist to draw in the cranes and symbols, then used a paintbrush to apply the color, using professional silk dyes. The background sky through which the cranes fly was sprinkled with rock salt while the dye was still wet. The salt is a catalyst for a chemical process that draws up the color and creates and beautiful, rainy pattern in the dye. The piece was then steamset for colorfastness, washed and ironed. The cranes also fly across a fun floppy cotton hat, for sale at my OneDogTalking shop at Etsy. The orange and yellow dyes are the hat are so vivid, the white really pops! I’ve also just posted a silk ACEO at OneDogTalking. I do love these birds! Entry filed under: All Posts, art and artists, symbols / personal iconography. 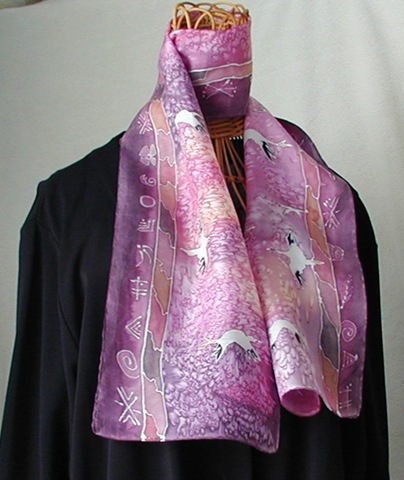 Tags: aceo, Althea Peregrine, AltheaP, art, cranes, hat, Janine Maves, scarf, silk painting, symbols. I love the drawings you do for your silk. Just lovely. Thanks Janine for sharing! The cranes are the most elegant and beautiful.